putthison: Q and Answer: What colour shoes with a navy suit? My favourite go to combination is navy suit and burgundy shoes. Q and Answer: What Color Shoes Should I Wear With a Navy Suit? Peter writes: I was recently given a fantastic vintage navy blue suit from the ’70s by my father. The only thing stopping me from wearing it every opportunity I have is the fact that I do not know what shoes to wear with it. I have seen images of men wearing brown and black oxfords and derbys and I really have no idea what is correct. Also, how does the choice of shoe alter which sock is appropriate? What color shoes to wear with a navy suit is a matter of perpetual debate. The general answer is that it depends on the circumstances and personal preference. The specific answer? Well, let’s run it down. Brown: Once, wearing brown shoes with navy was heresy unless you were a Boston Brahmin or a particularly wild Italian. However, brown is the default choice for daytime wear today. The color makes a comfortable partner for navy blue, particularly in darker hues like chocolate. 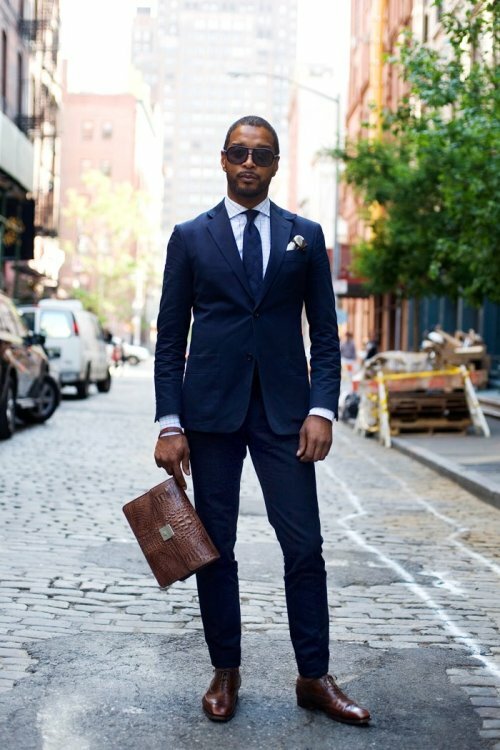 Whether brown shoes are appropriate in the workplace is up to you; there are traditional gentlemen in London who still think brown shoes are inappropriate at a business no matter what color your suit is. Black: This is the traditional choice, particularly in the English tradition. Black shoes are more suitable for business and the evening, and while I don’t go to a lot of suit-wearing business meetings, when I wear a navy suit at night, I reach for the sharper, more formal black footwear. Burgundy: Burgundy or cordovan shoes are the wild card here. (Note that “cordovan” is a color, “shell cordovan” a material.) They pair well with navy and are suitable for day or night wear. They’re certainly a somewhat bolder choice than chocolate brown or black, but I think they acquit themselves well. When I wear a navy suit during the day, I find myself pulling out my burgundy shell cordovan Florsheim longwings. As far as socks are concerned, your default should be to match your trousers – that means navy socks. This applies no matter what color shoes you’re wearing. In fact, you can pretty much wear navy socks with anything other than shorts. If you don’t choose navy, you’ll want something with some contrast, and that contrast should compliment the rest of your outfit. It can pull a color from your accessories, for example. It can also be a wildcard – once in a while, with a white square, blue shirt, blue tie and blue suit, I’ll wear red socks. Posted on June 14, 2011 June 14, 2011 Categories Shoes, SuitsTags navy, shoes, suitLeave a comment on putthison: Q and Answer: What colour shoes with a navy suit?